His concept was that Facebook has done an incredible job of connecting us as friends, but now where do we go from here. 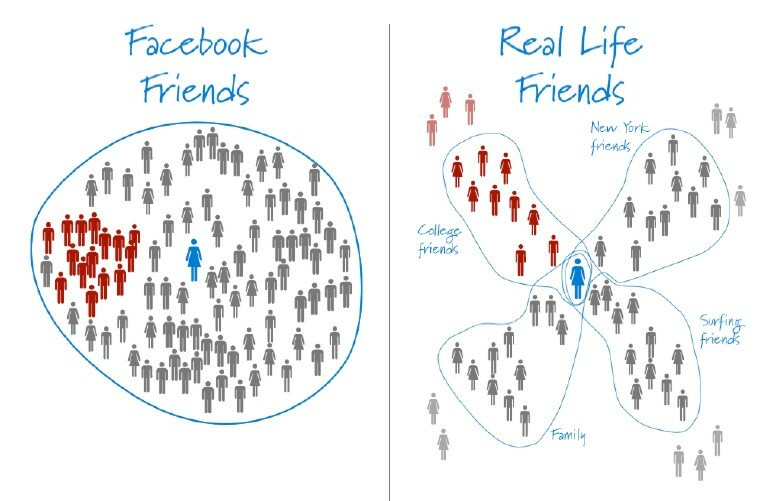 We have friends from a wide variety of contexts, from family to high school friends to work friends to weekend friends. Facebook’s initial success has been in its simplicity in bringing all of these friends together, and yet the dominant force holding many people back today is that they don’t want to get too involved with Facebook for fear that their various friends groups might mix, see photos they shouldn’t, or in the LGBT community’s case, expose to the wrong people that they are gay (or if they’re out, expose just how “gay” they truly are). Again, Facebook is an incredible success, but for those people who aren’t quite as open and transparent with all aspects of their life compared to others, Facebook’s ubiquitous success is also one of the areas holding it back. Facebook has responded with the concept of “friend groups and lists,” whereby a user can put their friends in these groups or lists and then control what the various groups and lists see. This works for some, but it can be a bit overwhelming to go through and adjust privacy settings for each of these groups, especially considering that one mistake in these settings can potentially cost a person a job (interviewers are using Facebook more and more in their background checks nowadays) or have the IRS at their doorstep (the IRS is also using this to evaluate whether reported income matches their lifestyle). His presentation also touches on the concept of weak friend connections versus strong ones, and that almost everyone in life is influenced by a maximum of 150 strong connections and thus the rest, no matter how influential they appear on Facebook, are still weak connections when it comes to being truly influential in a person’s life. 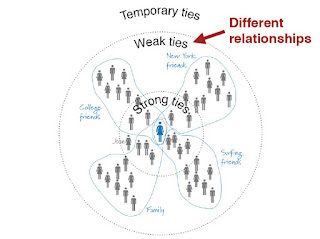 He also showed an analysis of how these strong connections actually communicate, and ironically they mirror very closely the social communication interactions of those 18-30 years old, helping to debunk the myth that somehow the youth of today are out of sync and disconnected from the real world compared to their more traditional, older counterparts (Gen X and Boomers). What his presentation and the subsequent articles and blog postings showed was that we are indeed in the infancy of social media technology and how it influences our daily lives. Social media has a ways to go as it expands and truly mirrors our real world interactions and how we’re influenced in what we buy, what news we choose to read, etc. 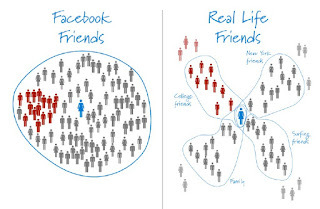 Thus, THE area of unbounded opportunity is in the social media world that expands beyond the concept of friends and begins to touch on the infinite number of Peer Groups that exist today. Peer groups can range from a “big wave surfer club” to an LGBT business association, with each having its own unique set of members, interests and topics from which they would discuss and share amongst themselves. These peer groups exploded in terms of their ability to communicate over the past 17 years with the advent of the Internet in 1994, and yet these peer groups were limited to website technology available at the time, including message forums, discussion groups, e-mail lists and more. With social media, these peer groups were all able to have a Facebook fan page, a Twitter account, a LinkedIn group and more, and yet how do these groups all merge and function as a more seamless environment directly from the place that most users would tend to start with first, the peer group’s website. Yes, there are wonderful widget integrations of Facebook and Twitter that can be placed on these pages today, but where does the future truly lie with peer groups in the social media world. When you stop and think about it, again the opportunities are infinite. What we’re seeing today are the first peer group community-based websites doing just this. They are going beyond the concept of FriendFeed.com, which is a website recently bought by Facebook that brings together all of your social media activities across the Internet into one, concise news feed summary and shares them with your other friends using FriendFeed.com as well. Thus, your blog postings, your YouTube videos, your Flickr photos and more can all be shared with FRIENDS, but they do nothing for your peer groups you may be a part of. Websites in the LGBT space such as Fab.com and GayCities.com are the first entrants in this, using an integration with Facebook and FourSquare in order to share a person’s events and place check-ins with fellow gay people, not just their friends. Thus, if you are a business and you post an event on Facebook of which a Fab.com or GayCities.com user is attending, that event will now be shared not just with their Facebook friends but now also with all other gay people using Fab.com or GayCities.com as well. If a gay person checks in at your bar, restaurant, club, hotel or store (using mobile Smartphone technology), and has opted to share these check-ins on Fab.com or GayCities.com, your establishment is promoted far and wide, beyond just a person’s friend network (weak or strong connections) and into the world of peer group interactions. Peer group interactions have the ability to be even stronger in their ability to “get the word out” about an event or your business, in that the number of people interested in what other gay people are doing in their part of the world is quite large, so even though the message has been delivered from someone they may or may not know, the fact that they share the same peer group interests weighs in to influence at least some of them and again, expands your business’s exposure in the online social media world. In the business-to-business world, social media and peer groups probably have their best opportunity with technology and websites similar to Fab.com and GayCities.com. Integrating a business’s blog, video and photo postings into a website where others of similar interest are “networking” online helps to expand a company’s marketing outreach in ways that were unheard of just a year ago. 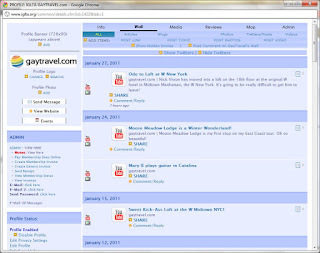 Thus, organizations such as IGLTA.org and CaliforniaGayChamber.com have integrations with social media allowing the folks with Palm Springs Tourism, Swedish Tourism and Sonoma Tourism to all network and share using their social media activities in a fully automated and integrated fashion. Every time the social media marketer in Sonoma uploads a new blog posting, it doesn’t just get distributed to their fans on Facebook, their members on LinkedIn or their followers on Twitter. It now also has a more permanent home and a wider distribution on a website that is dedicated to LGBT tourism and travel for both consumers and businesses to discover as well. Sonoma isn’t doing these blog postings for fun… they are doing them to help spread the word about their destination to potential travelers, so the more peer group websites, both consumer and business, help them to achieve their marketing goals, the better Sonoma and other destinations will do in terms of maximizing their social media marketing outreach and the more emphasis they will place on this marketing discipline above all others. 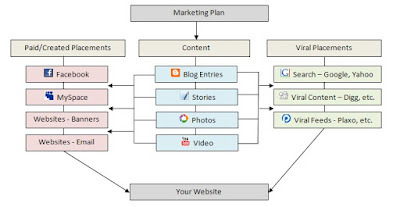 This is what we here at Pink Banana Media see as the future of marketing and communications in 2011 and beyond. The opportunities for new peer group social media-integrated websites are endless, and the more users embrace and become comfortable with these technologies (600 million strong on Facebook and growing), the more effective a social media marketer’s job becomes. Merging real world social interactions (attending an event, eating at a restaurant, dancing at a club) with online social media is the wave of the future that is here with us now.